The caterpillars are still there but their numbers have diminished dramatically. The original 400 or so are now down to 10 or 20. I have seen some leaves nibbled up but it's nothing compared with the rest of the tree. Now that the ants have woken up I"m happy to see Formica, Crematogaster, and Camponotus species all roaming around the tree. Mostly they're sipping at the fresh sap from the newly emerging leaves. Though I haven't seen them going after the caterpillars I can't say that I've seen any caterpillars outside of their protective tent. I have not been able to get a good picture of any of the ants on the tree. Mostly Formica are all over it in the day, and Camponotus replace them at night. Crematogaster only have a forager now and then, but nothing special. 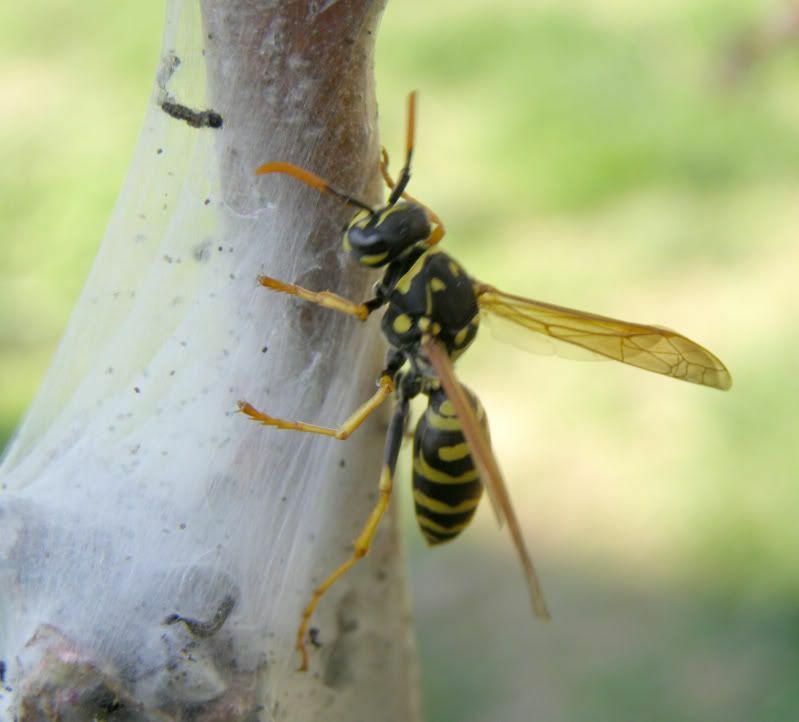 A wasp was also probing over the tree and attacked the web a bit. One caterpillar on the outside was attacked but then ignored. Probably to small of a meal. The wasps know where the nest is though so they'll be back to get any of the big ones. The end result so far is besides a few flowers, less than 10, of probably 200 blooms these caterpillars haven't done any damage. I don't know if the cold night we had will effect the fruit at all. Assuming the frost didn't effect the bloom I don't see any reason why I won't get some fruit. Though it wasn't the most impressive bloom in the forest I saw Honey Bees and a few species of Mason Bees working the flowers. 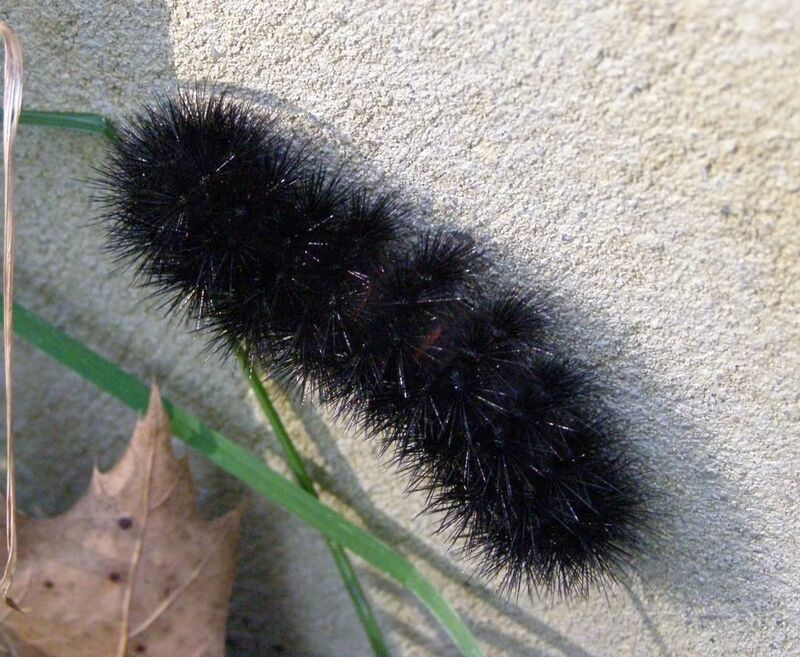 This is the Giant Leopard Moth, Hypercompe scibonia, and this photo was taken last fall in November or there abouts. I always assumed they made cocoons and over wintered but boy was I wrong. 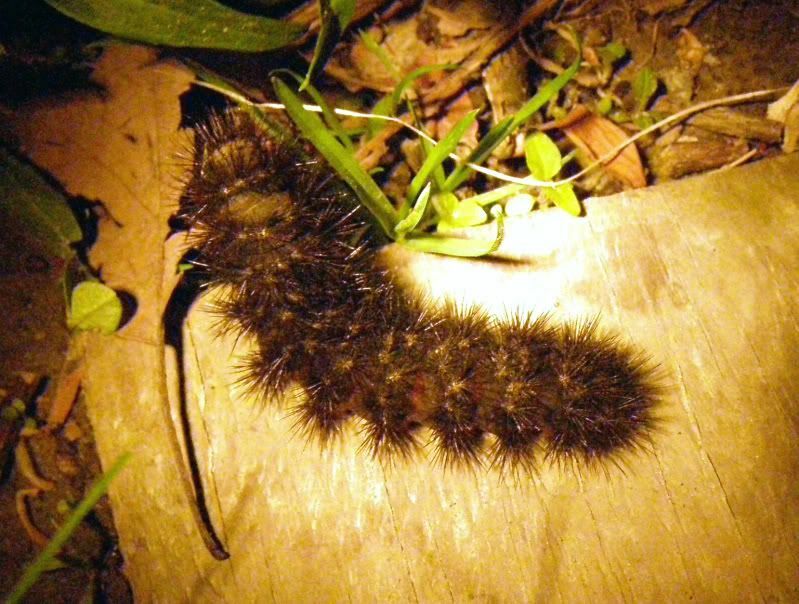 Here is probably the same Giant Leopard caterpillar in a picture I took earlier this week. It's about 5 inches long now! 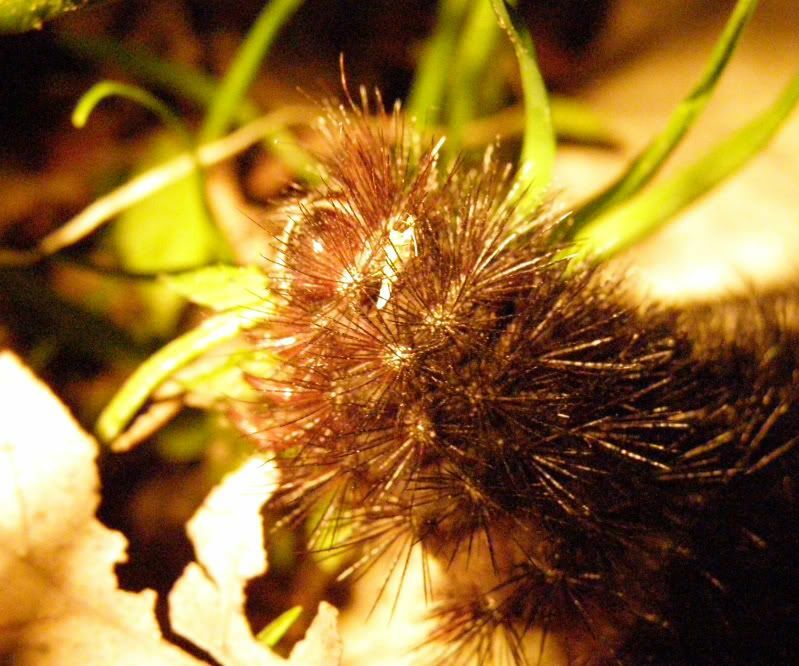 They're commonly seen in the fall along with Woolly Bear caterpillars, but now that it's spring their grazing has turned nocturnal. According to "Caterpillars of Eastern North America" by David L. Wagner, I read that common food plants are broadly popyphagous, many forbs or woody plants, including cherry, dandelion, oak, plantain, sunflower, violet, and willow. Here in the photo it's hard to tell but it is eating a dandelion. During the day he probably takes refuge in our wood pile. Yesterday I went to the Mt. Cuba Center (pronounced Cube I think,) to see the Trilliums. This post isn't about that but I will talk about them later. The Mt. Cuba Center is a very large native plant garden, but I should point out not all the plants are native. 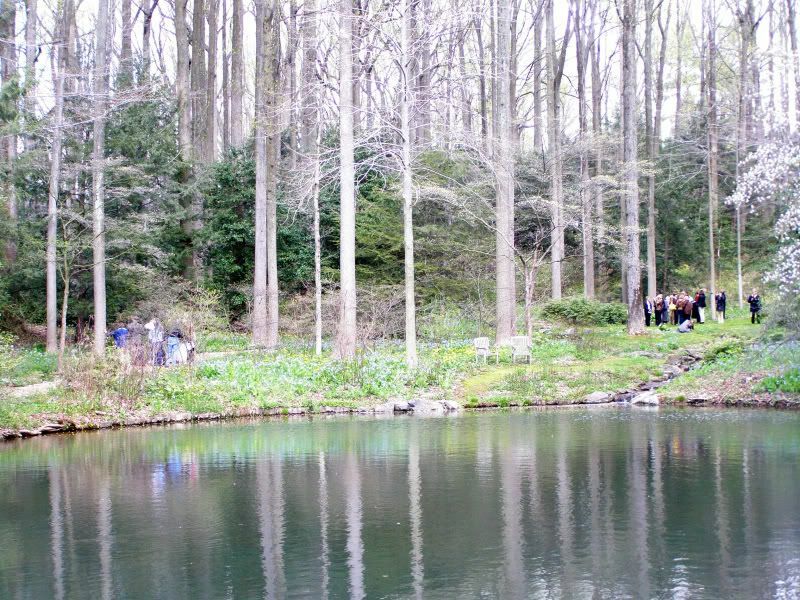 Probably my favorite part of the garden was their lake/river. It is a man made structure but they do a fair job of keeping it natural. Painted Turtles sunbathing on a log. Along the sides is a barrier of moss that is maintained. 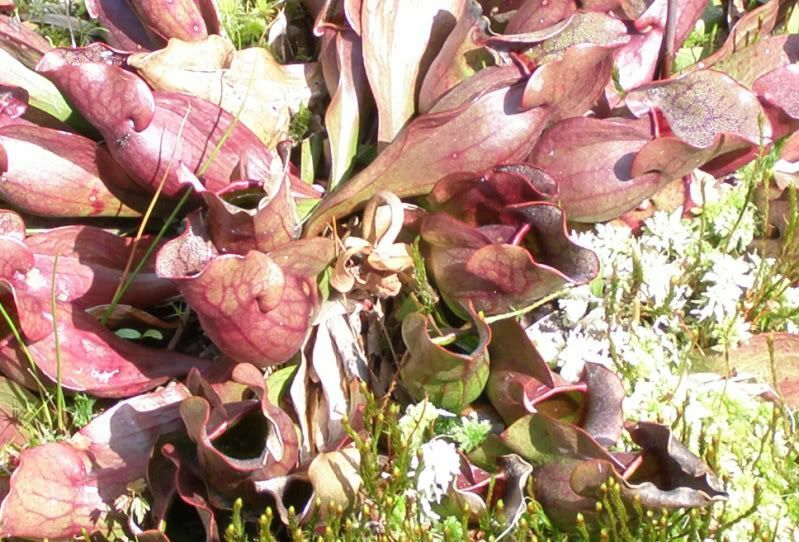 Bug eating pitcher plants lined the sides. I'm going to start with a list of ways, easiest to hardest (about) that you can help save the planet. Some of these might only apply to Americas but the concepts are still the same. 1) Go see the new Disney film "Earth" which is out in theaters today. Disney has promised to plant a tree for every customer who goes to see this film opening weekend. So you have until the last showing on Sunday (April 26) to see this movie. Although the trailer made the movie out to be stock footage of animals I assure you almost all of those scenes were used in the trailer and there's still 6 reels of stunning visuals to behold. Much of it has been shot specifically for the movie. Go see it. 2) Donate $10 (I think) to the Arbor Day Foundation. Doing this not only supports the planting of tree but they'll also send you 10 saplings in the mail. When given the choice, you should always go with trees native to your region. This way insects will find the most use from them and this in turn benefits migratory birds and so on. The only real issue I recall having with this place is they don't monitor what varieties of the tree they give out. 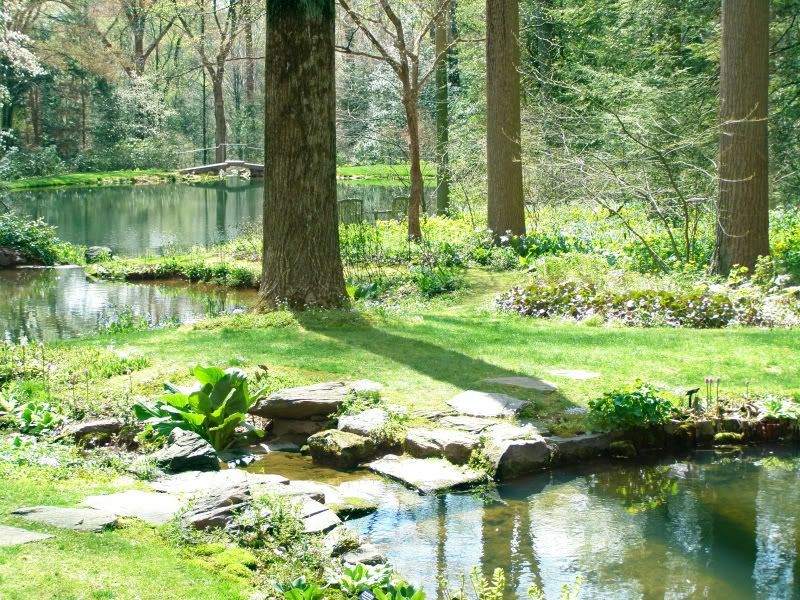 So if you keep the Dogwood saplings for example they might be our native Cornus florida, or the imported Cornus kousa which is useless to insects of North America. However, it's better to plant a tree than to not as it will reduce your carbon footprint. Most of the tree they give out are beautiful and beneficial. 3) Plant a garden. Anything that reduces the size of your lawn is greatly beneficial as lawn mowers use way more gas than cars do. Fruits and Vegetables, regardless of their origin benefit you because you're getting some much needed vitamins in your diet. Plan for the future and plant a fruit tree and grape vine. Though you probably won't get a lot of fruit off of either for the first few years, compare the cost of the fruit to the cost of the tree. Varieties of Sunflowers will benefit pollinators and you'll start to see Gold Finches and maybe other birds as well. There are loads of options out there so start taking advantage of them. Concord Grapes, Vitis labrusca, is native to the America, and very disease resistant. Blueberries, Cranberries, and Huckleberries are also native and do well here. Blueberry bushes can be planted right in the landscape though do require some acidity and good drainage in the soil. Well those are my three for the day. For the past week now Mevio has been upgrading their website. This happens off an on and it annoys me to think people can't watch the new shows of Ant Chat.... and that I can't upload any new ones until they stop doing this for a day or two. I'm finishing up one show and it might be done by this weekend. My regular job, needing to replace tires on my car, and going away are all things preventing me from finishing it in a timely manner. I am determined to get it out before the end of the month though. So I don't want anyone to think the show is going away anytime soon. But if you're subscribing to us on iTunes you might see a little "Error" icon whenever your podcasts update. It was a beautiful day outside. 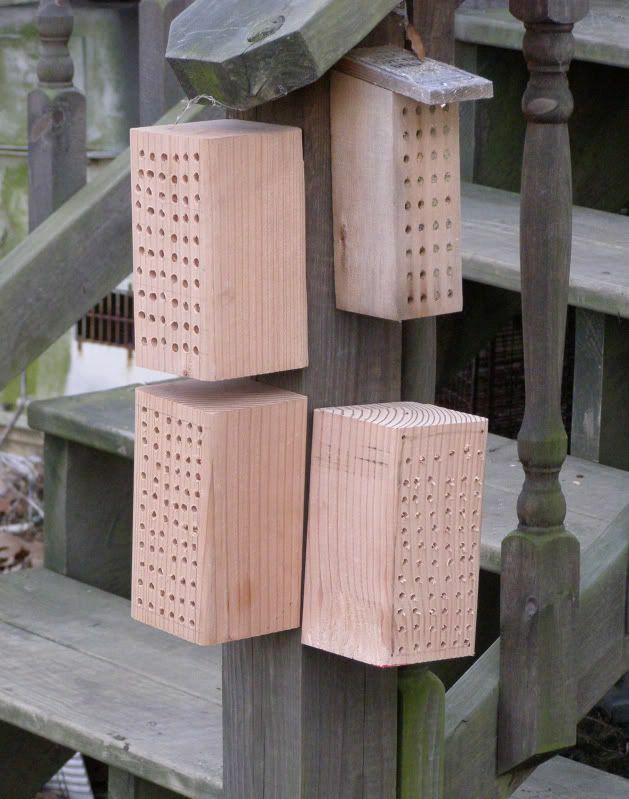 The bees were all over the nesting blocks but I can't say that they were the only ones in the action. Ants were all over legs deep in pollen. 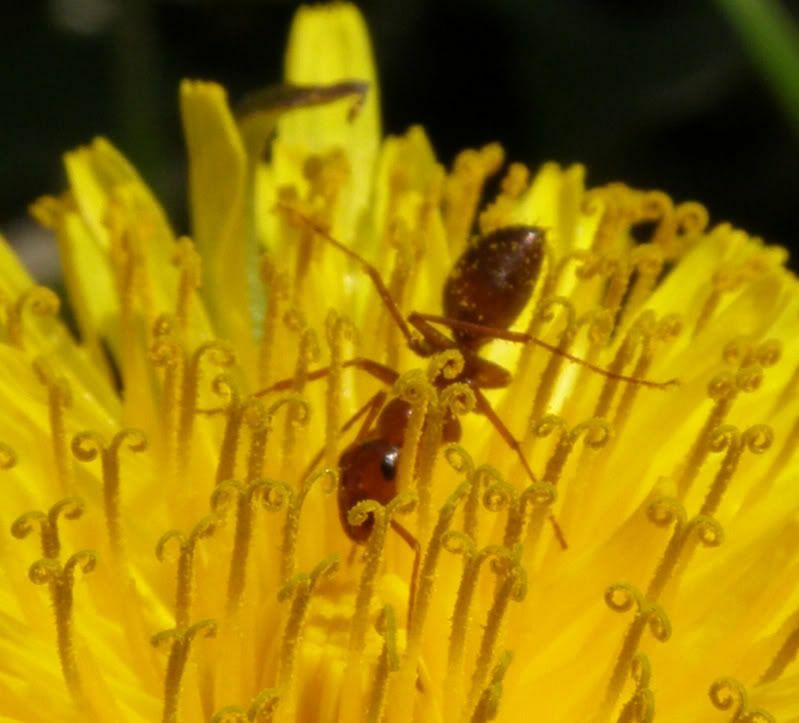 Formica, and Tapinoma were both in dandelions. 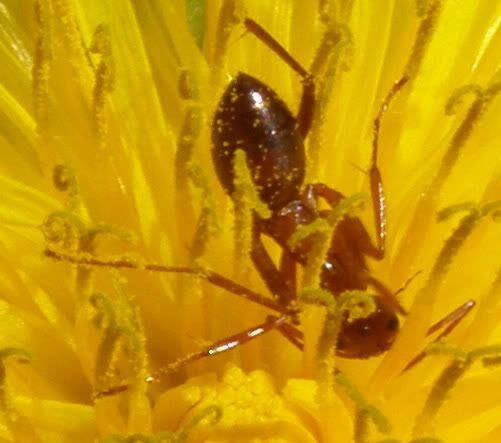 Considering the parts the ant have to tough and how covered in pollen they are, it's likely that they are pollinating the flower. Not that these flowers need any help with pollination from ants. Just about any bee will work the flowers. This little girl was licking nectar out of a creeping mint that is All Over My Yard! I tolerate both because they're worked by bees. The mint plant does get in the way in the garden though but at least it looks pretty in our walkway. I couldn't get the color right though but they are more blue than seen below. Dandelions are also a native plant and really I think the only weedy part about them is the seeds that follow the flower. I actually think that Dandelions might be an ideal plant for captive colonies. Pollen is fed to honey bee larva and I suspect ant larva may find nourishment from this too. The plant could be dead headed after flowering to promote blooming. Well that didn't take long. One of the Trilliums is flowering at a very low height. I don't know the species name to this one in particular but it's only 3 inches tall, and that's a flower bud on it. I know it's red flowering one though but we'll see how true that is. Color can vary with Trillium species though one color does seem to dominate. 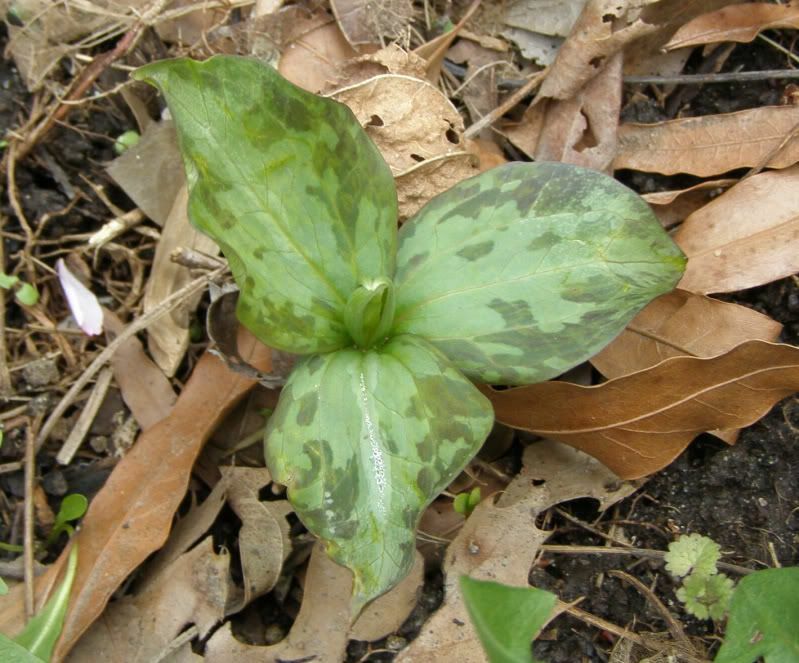 Assuming it's pollinated though I should get some Trillium seeds to test around and see what ants like them or just see if/how they distribute around the yard. Other Trilliums I have are a bit taller than this one, but don't have the flower bud yet. This is fine I think though because they might still produce more leaves (series of 3) before flowering. Or the flower bud is under or to the side of the leaves and I haven't noticed it yet. In either case I'll be planting more trilliums for years to come until I get a continuous bloom. 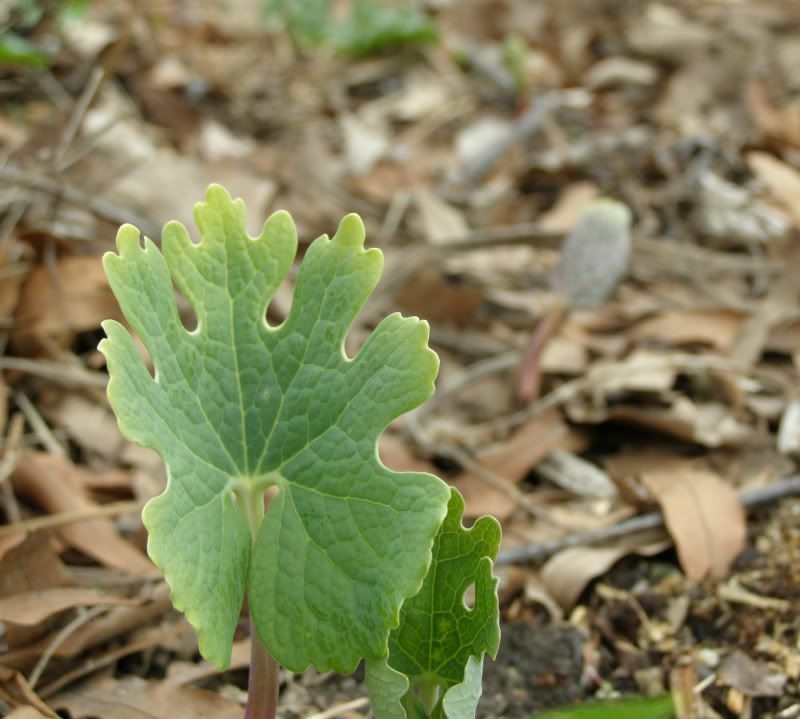 Bloodroot is also coming up nicely. However I don't know if it will flower this year. All the pictures I see online show them flowering before the leaf unfolds. As a landscaping plant I'd say this could be treated and planted anywhere you'd think a Crocus would look nice. They bloom a bit later though. And as with the Trilliums they are distributed by ants. Hopefully all these ant plants will pay off and I'll get some pictures of ants obtaining obtaining the seeds. 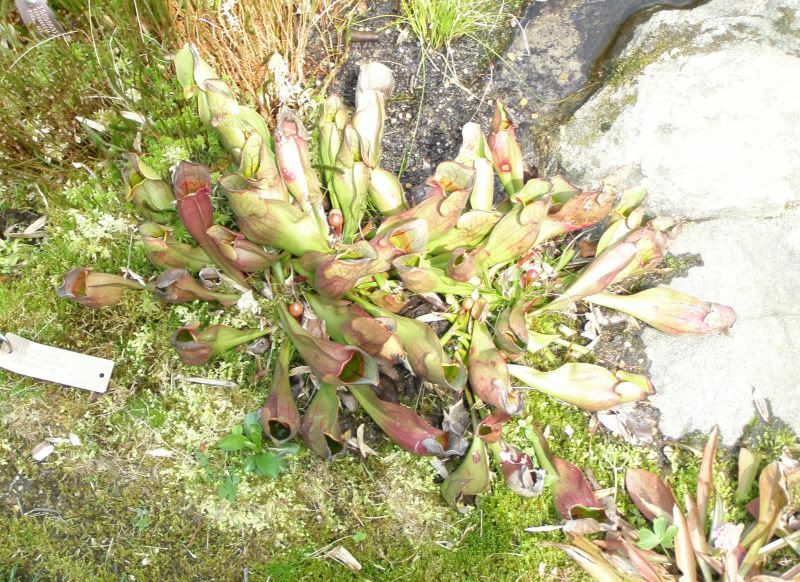 These plants might even mark where some ant colonies are. Well I have my seeds for the year planted. Peas, Tomatoes, Parsley, Fennel, and probably other plants I'll buy as starters later on. And I wanted to devote an entire flat to Lupinus perennis which I'd bought 1oz of from Prairie Nursery. It's actually a pretty plant as well a host plant to one of those endangered butterflies I'm always going on about. It doesn't flower it's first year and I don't have any pictures of it otherwise so here is a Google search of Lupinus perennis. So I have the flat ready when all of a sudden I douce the entire 1oz packet of seeds with the garden hose. So that's about two hand fulls of seeds (maybe a few thousand) that are all about to grow. Granted I was going to plant them all anyhow, but it would have been nice to have some spare laying around. So now I have two flats, and several flower pots, some belonging to my neighbors without their knowlage, devoted to this one wildflower. I'm sure the endangered butterfly will be thrilled. So the point here is, depending on how many of them germinate, I might be selling or giving away a lot of this plant in the near future. We'll see what happens. The seeds might require chilling for a few months. If only I had another oz of seeds incase none of these grow. Oh well, I tried. If nothing grows in a few weeks I'll attempt chilling the flats, but I think I've seen lupins come up normally in some seed mixes. Took some more pictures today of the bees working the nectarine tree. 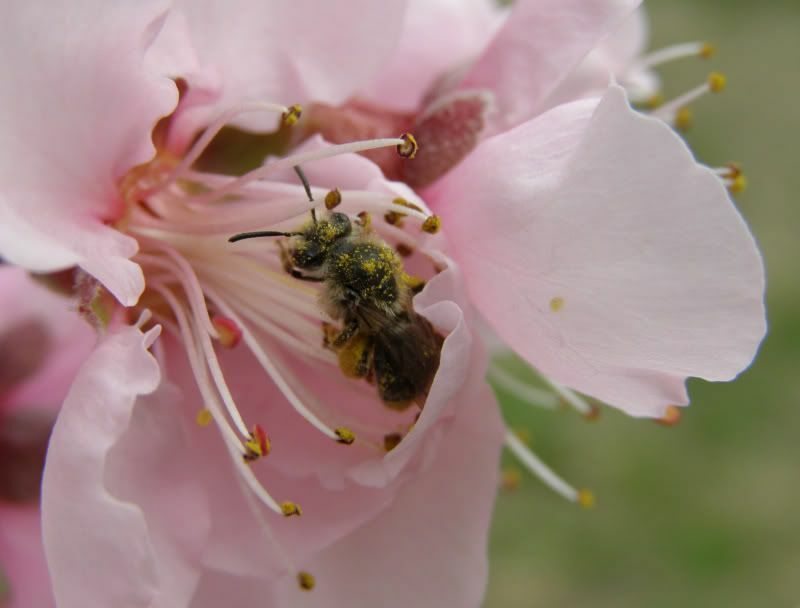 I notice that Honey bees have a much easier time flying around and visit far more flowers than the mason bees. 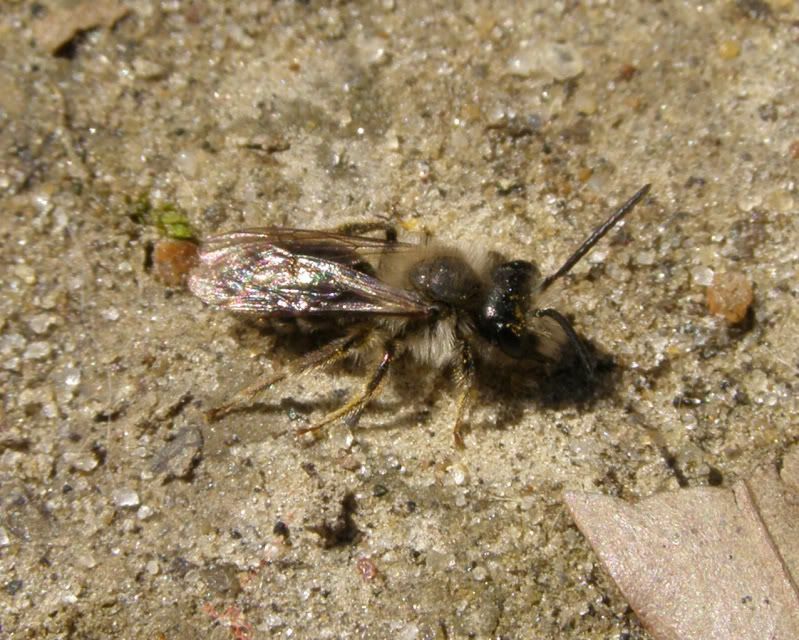 But whenever the mason bees do enter a flower they come out completely covered in pollen. I think it's their weaker wing that prevent them from flying the great distances that honey bees do. I believe the smaller size of the mason bees allows them to reach more parts of the flowers too but we'll see who the better pollinator is. If nectarines didn't produce only one seed (I think) I might have marked what flowers are visited by what bees with ribbons or paint or something. This is all that's left of the caterpillars and I'm wondering why I ever though they'd be a threat. I removed two clusters of them out of fear they might devour the tree. There were still quite a few groups of them left and lots that had spread around on their own. I don't know what happened to these other groups but there's only a few of them left. Because they're only on the one branch I don't think they're going to harm the end harvest if any. So last year I attended a talk by Doug Tallamy at Mt. Cuba in Delaware. He was giving a lecture and promoting his new book "Bringing Nature Home: How Native plants Sustain Wildlife in Our Gardens" and one of the underlining themes of the night was just as the title suggests. Ways to make our land more sustainable to the native wildlife. This need to own unique plants and have the best design around has gotten out of hand. 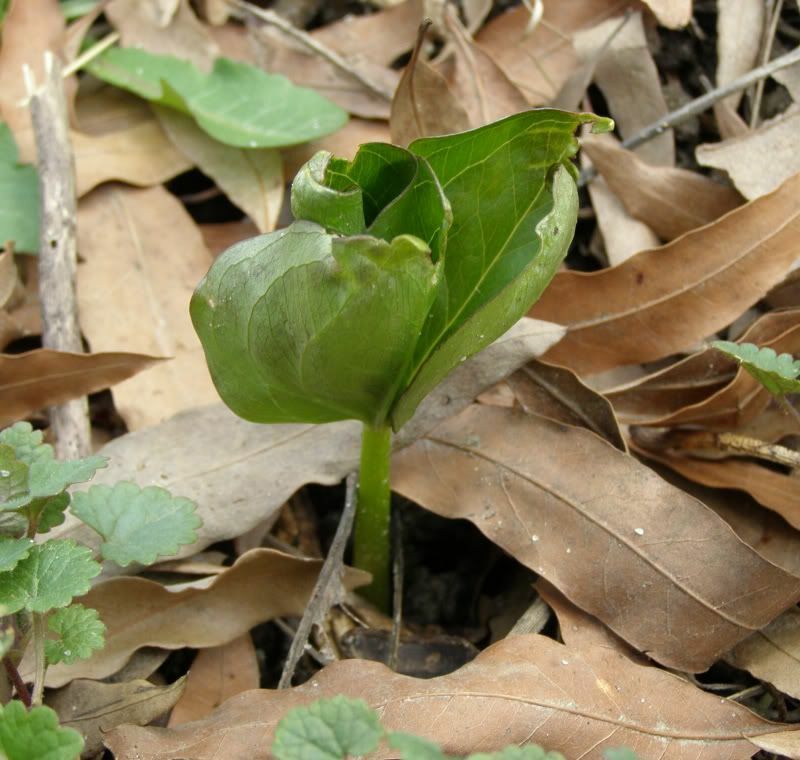 These are often nonnative plants to the region, and offer nothing in the way of supporting nature. It starts with a few people importing a unique plant, growers then mass produce it and it's sold to the public who do little if any research on what they're buying other than the information tag which markets the plant's highlights. The trouble with this starts with insects. Most of these nonnative plants are marketed as Pest Free. This is an awful lie but I won't get into that. The trouble is our native Lepidoptera (Moths and Butterflies) use native plants 40 to 1 as their hosts. This varies from species to species but what's imporant about these insects is they're abundant. It takes a hell of a lot more than bird seed to feed a baby bird. The lack of native plants has drastically damaged the population of our migratory bird populations as a result of all this landscaping. So naturally after the talk everyone who attended the talk recieved a native plant. In this case it was Chelone glabra, White Turtle Head. The reason for this is they're trying to save a threatened species of butterfly, The Baltimore Checkerspot, Euphydryas phaeton. Naturally I was happy to plant a host plant to such a butterfly out in the garden. I can't say if it survived yet but I do see something growing where I put it. I'll post back later on. Now as a rule to butterfly gardening they usually suggest that you have 3 to 5 of a single plant to really get the species's attention. And I have to say this is true for wildflower, perennials. (Trees don't worry about.) This applies for nectar plants as well host plants. My friend who has a single plant of Milkweed has never had a Monarch butterfly lay any eggs on her plant where as I get Monarchs every year becuase I have 4 milkweeds of one variety and recently added several others. A story told at the lecture was how this butterfly wasn't seen in New Jersey for some years. But some garden center, (I wish I could remember the name) started selling it. Well suddenly they discovered all these caterpillars all over the plants and they had started spreading to other local plants. As it turns out the Baltimore Checkerspot is still here in NJ. And this is the entire reason this plant was given out. The trouble I'm having is I can't find anyone selling White Turtle Head. I go to some very good plant nursuries, and websites, and they're all selling Red Turtle Head, which isn't used by the Baltimore Checkerspot. Or they're selling Physostegia virginiana which lookes just like White Turtle Head, but again, doesn't work. So this is all leading me to wonder if there isn't a mass shortage of this plant. So if anyone out there can help me I would appreciated it. The Prenolepsis imparis queen I caught is so far doing fine. 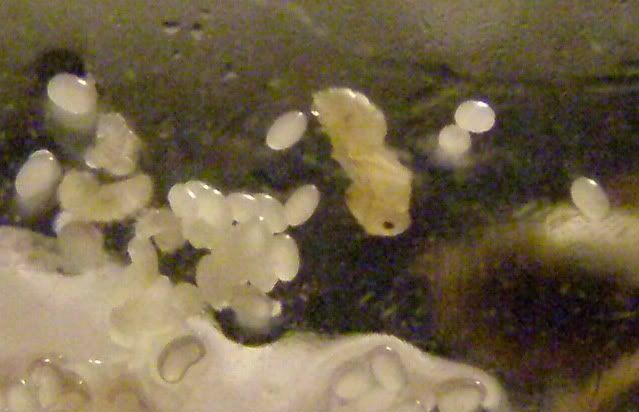 She has a nice cluster of eggs and will probably have some workers in a few weeks. Of course that's still a month or two off. I'm still finding males to them gathering around lights at night. Nuptial flights are still going on along forested areas and one should keep an eye out for them there in the afternoon hours. 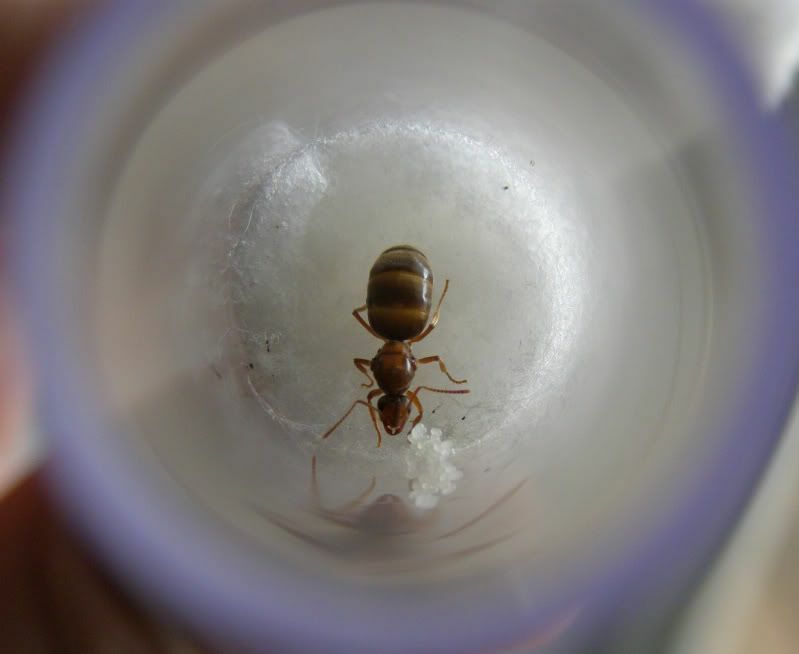 Several queens of Lasius neoniger I caught last August are also doing well. However, I'm having some condensation issues in their tubes and needed to adjust that. I'm trying to figure out a better way to get them to move to a new test tube and allow some sort of ventilation to occur so condensation doesn't become a problem. 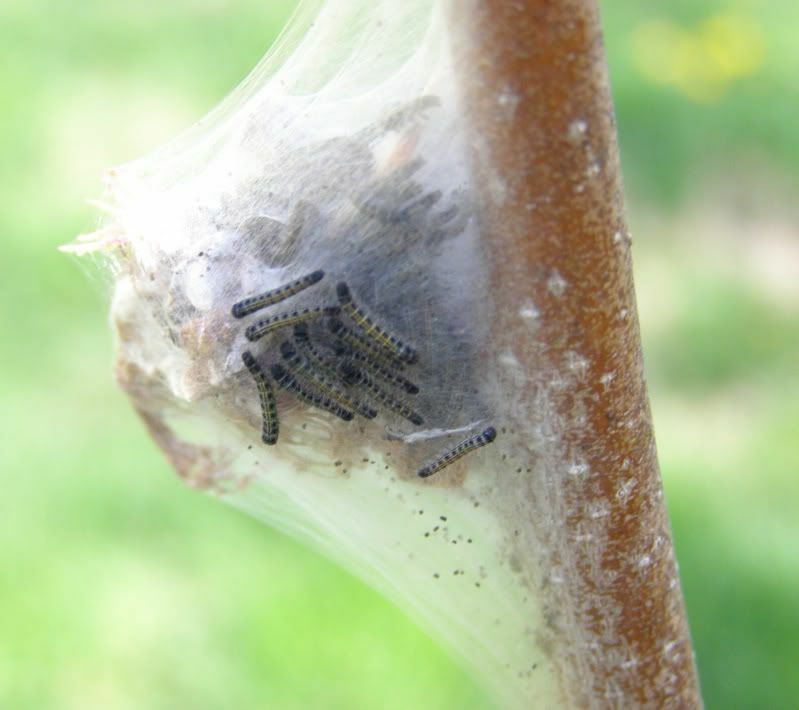 In the process of fixing this issue I noticed several of their larva did not spin cocoons. And this is an interesting thing the bring up. 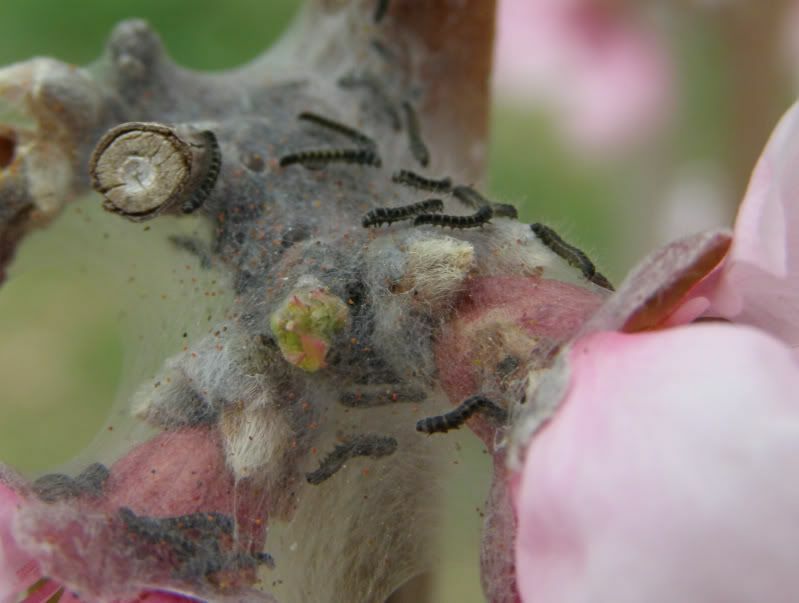 Wild colonies have access to dirt and flakes of dust (they nest in the ground) and when it comes time for the larva to spin a cocoon for it's final metamorphoses they need a bit of debris to get started. In a test tube setup, among other clean setups, they rarely have this option. 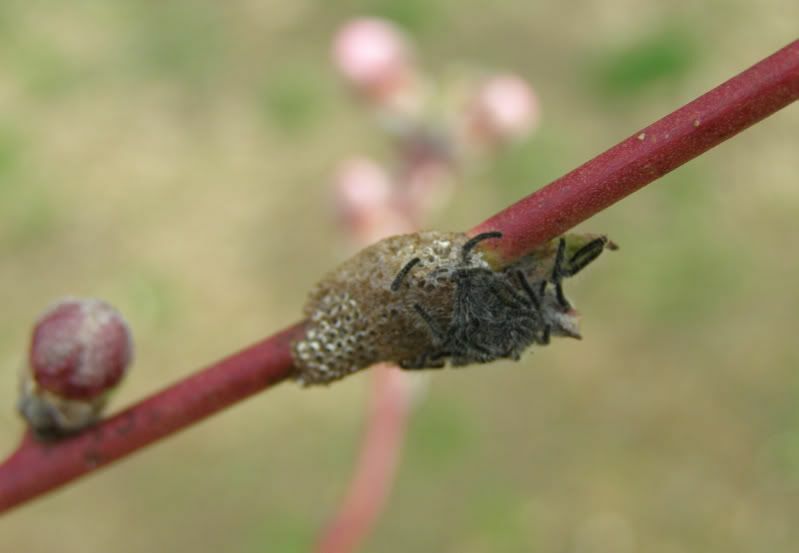 Thus captive colonies mostly produce naked pupa and one can gage how tidy the nest is. The caterpillars on the nectarine tree have completely vanished! 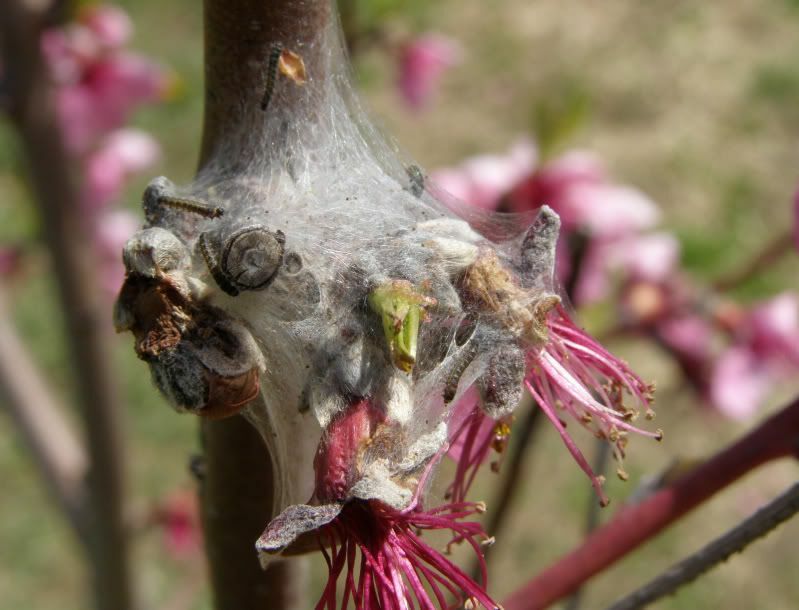 It's been windy the past few days and I saw a few entering the flower buds for shelter, while others spun cocoons. While I did notice some unopened flower buds were hollowed out I can't say that I see any on the tree. They remained on one of the weaker side branches of 3 or 5 main ones and I'd say weren't that big of a pest at all (so far). They're either really good at hiding or were eaten by something. Well spring is certainly here for most of the country. Garden stores are stocking up on easter plants, but I urdge readers to not get carried away by them. It is the perfect time to buy yourself a fruit tree, berry bushes have a lot to offer, and genarally anything native to your part of the world will be beneficial. I'm thirlled to see Lowes Hardware has more plants labled Native this year and they're even seated on the shelves next to the regular plants too. 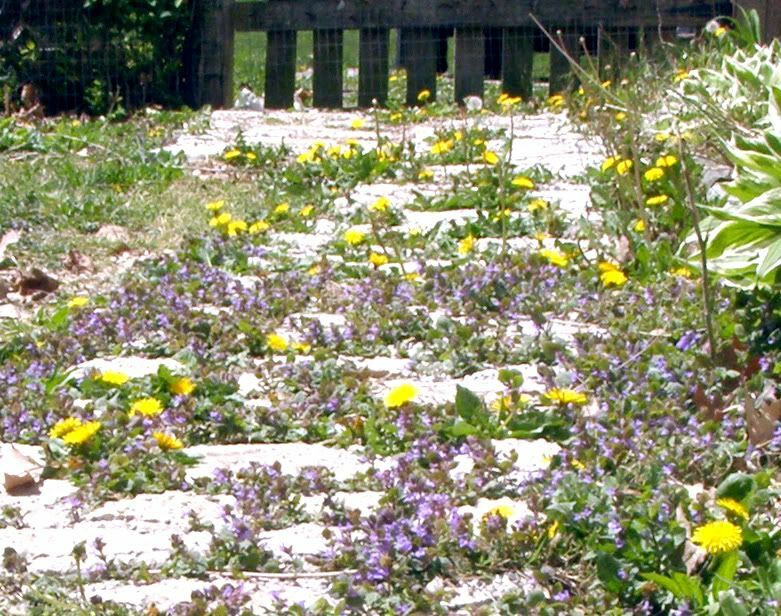 The benefit that native plants offer is they are useful in far more ways than the nonnative. Most native plants that flower support a pollinator. 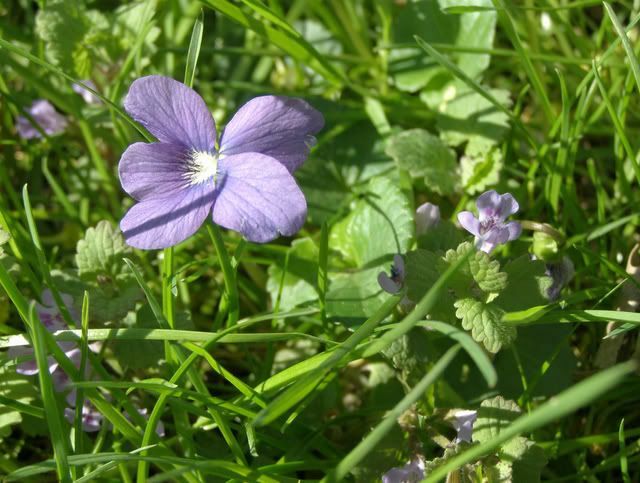 Plants that are targeted by caterpillars offer food for young birds, weather it's a tree or a sun loving wild flower. Shade wildflowers too have much to offer and many are even distributed by ants as I read in "The Ecology and Evolution of Ant-Plant Interactions." This book has me inspired to include more plants that are distributed by ants out in the yard. One plant that has been growing out in the yard for years is the New Jersey State Flower, Viole sororia, pictured above. This is not featured in any of their lists in the book as a plant distributed by ants. But it has me wondering. You see in the past I had wondered if this plant was distributed by ants and located some seeds from one. These are featured on pods very low to the ground, an ideal place for ants to find them. So I gave some seeds to an Aphaenogaster species which didn't care about it. Thanks to reading this book I now know more. One would assume Aphaenogaster would make an ideal seed distributing species for it's nesting in woodland habits here on the east coast. 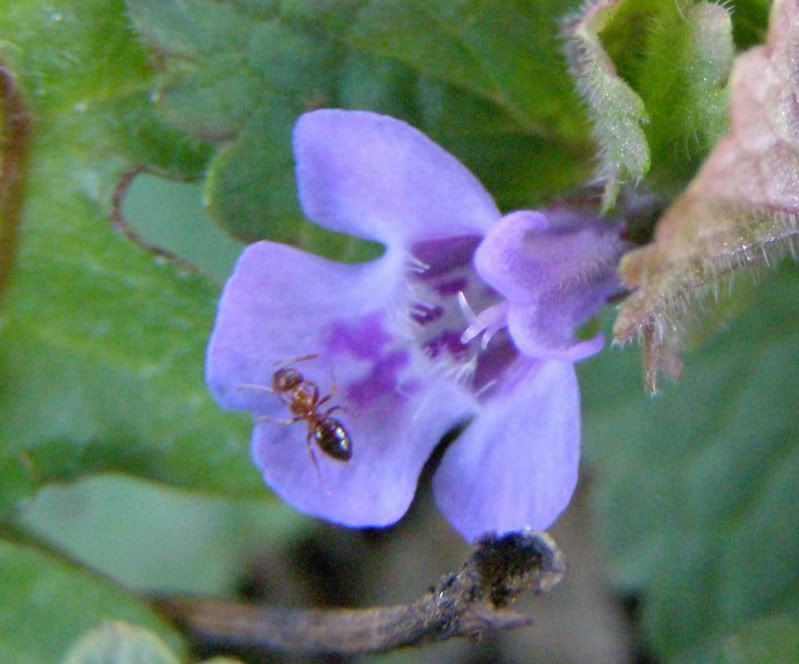 But the thing is Aphaenogaster don't nest near this particular violet out in the yard. Assuming it is being distributed by ants, Aphaenogaster wouldn't be the ideal candidate. Tapinoma, Formica and Lasius however do nest near it though and would make for an idea distributor. I'll have more on this topic in a later post. It's been very windy here the past few days and nothing has really been done. 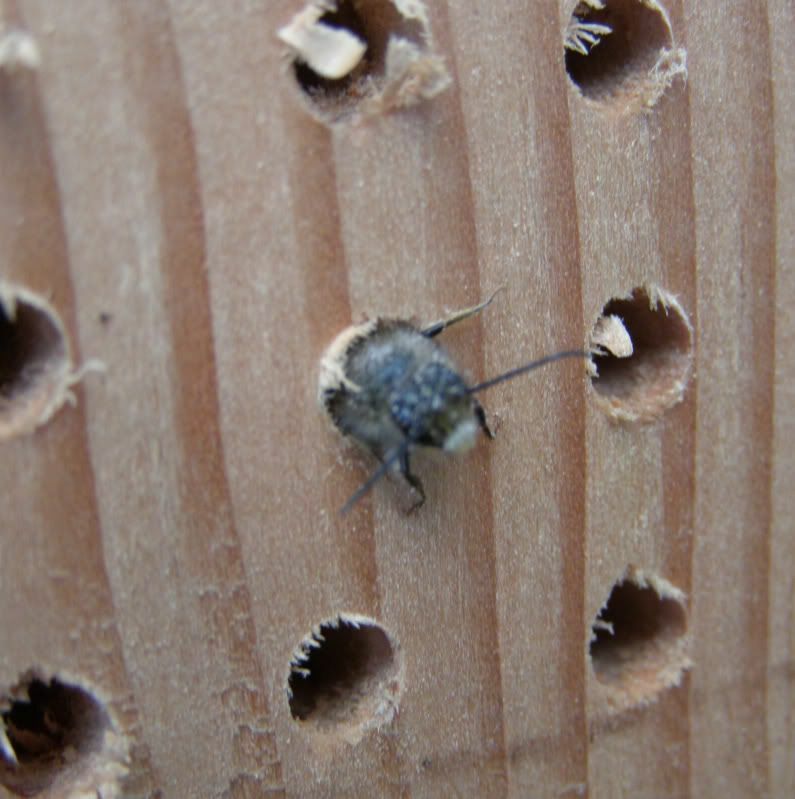 I'm seeing more Mason Bees flying around. And happy to see they discovered the nectarine tree. For the most part they buzz around it zigzagging left and right over it. Most are not doing anything at all besides flying but occasionally I see one land on a flower and really work it. This is uncommon though and I haven't gotten a good picture yet. The caterpillars have have spread to a few more flowers. They ball up around the flower as one great mass of fuzz. I though the wind would have blown them off but I was apparently wrong. Tiny silk webs have formed around the flowers they are on. I didn't realize so many of them would come out of one egg sack. There must be 400 or more. Because of this I've removed two of the clumps of caterpillars. I'll continue to do this as I feel is needed. I have every confidence that they could eat every flower on this tree. I will test them as a source of ant food later on. Earlier today NPR aired an interview with Edward O. Wilson. Give it a listen here. Also give this a listen too. Butterfly Does Great Ant Impression, here.